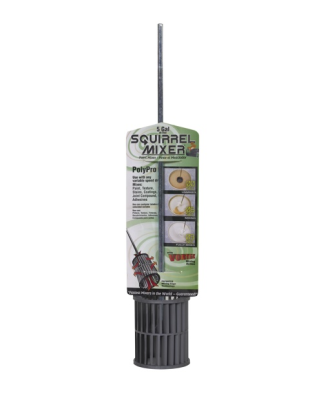 Squirrel Mixer - Industrial Plasters Ltd.
Squirrel Mixers have a unique cage design. Ideal for use in a variable speed cordless drill, they use a vortex mixing action that pulls liquid simultaneously from the top and bottom. The result is an amazingly fast and thorough mix. These mixers are made with high-quality materials, including solid-core steel shafts, are lightweight and very easy-to-clean by spinning in a relevant solvent. They can be used to mixing Plaster, Silicone, Resin, Paint; practically any liquid however viscose! The mixer has a steel spindle and the mixing blades are made of tough polypropylene that won’t chip, flake or rust and will not damage your mixing tub. It is 485mm long, 80mm diameter and ideal for mixing as small as 5 litres and up to 40 litres of material.